Once students understand the idea of a fraction, they are ready to learn how to use written symbols. Introduces the concept of the fraction with the written symbol; practice at writing and shading fractions. Explore how to accurately fold a piece of paper and cut shapes into halves or quarters (fourths), in different ways. Using a number line to find equivalent fractions. Requires competency in ability to divide a number line into fractional parts before beginning. 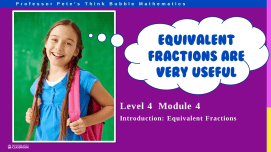 Uses understanding of the size of a fraction (determined by the denominator) and introduces the complexity of comparing with numerators.